DO YOU KNOW WHAT I DO? | John Beiter, PhD. I recently enjoyed the opportunity of attending a local networking group, Motor City Connect, here in Michigan. The guest speaker talked about his 5 pillars of success. One of my key take-aways from his presentation was to ask the people who know you best – Do you know what I do and would I be the first person you recommend for what I do? This was huge for me being a dedicated, life-long introvert! It seemed so simple and full of common sense that I had to remind myself of what Covey said, “common sense isn’t always common practice!” Needless to say, I started to employ that suggestion immediately and – yes! – I was surprised to see how many people really did not know what I did – they do now! So I wanted to take this opportunity to share the story behind my Health Bell initiative that I started last summer. I volunteer every year with the Michigan Men’s Health Foundation when they take over Ford Field to provide free men’s health screening for the disadvantaged of Detroit. The head of the Foundation and I have had various conversations over the years on how to get men interested in taking a more proactive versus reactive approach toward their health. These discussions got me thinking about what kind of sign would it take to get people [everyone, not just men] to get on board with making their overall health a priority? On May 31, 2017 I had this epiphany while working out about a universal health symbol that I thought everyone could get behind and support. I had been noticing that there were overwhelming examples of coupling the words “FIGHT” with the various health conditions, e.g. cancer, leukemia, diabetes, dementia, etc. This inspired me to take the ‘ribbon’ that the women made famous and hang a pair of boxing gloves off the talons. When you see a pair of boxing gloves the association is automatic to the word ‘FIGHT’. I then surrounded the image with the words ‘FIGHT FOR YOUR HEALTH’ and had them manufactured onto a small pewter bell that the owner can carry around with her or him on car keys, purses, gym bags or whatever item you are in regular contact with on a daily basis. I like to remind people that the only person responsible for fighting for your health is you! As a psychologist, I introduce the bell as a hybrid between classical and operant conditioning. What I mean by that is first you won’t hear the bell ring all the time but when you do – you are to state this positive affirmation – ‘EVERY DAY IN EVERY WAY I AM GETTING BETTER AND BETTER’. This statement has a lot of research backing it up to how the mind absolutely helps the body heal and it is never the other way around. Second is the hybrid of classical conditioning – this was Pavlov’s dog salivating when he heard the bell ringing and operant conditioning was changing a behavior – the hybrid comes into play when you hear the bell – the carrier can decide what health related behavior they want to effect, e.g. eat a salad instead of fried food or make sure you do some form of exercise that day, etc. After the bells had been manufactured, I couldn’t believe how many people were not only interested in learning about them, but wanted to purchase them. Some people bought them for themselves but most bought them for someone in their life that was battling a serious health condition. One grandmother last Holiday Season bought 14 of them to give to her grandchildren to remind them not to wait until they were her age to start caring about their health. I soon discovered that as I shared my story about the bell that many people had other ideas as to where it could be effectively given and applied. The opportunities seem limitless to help people fight for their health. When a bell is sold, I inform the purchaser that a bell will be donated to those I come across in my travels to get the message out there. I have given bells to people with cancer, lupus, leukemia, waiting for a heart transplant, and many more touching stories or very serious health conditions. My initial vision for this bell was to get it into every cancer treatment center around the world to be given to the patient by the treating physician or treatment team member. In most major medical centers there is a tradition that when a person completes treatment that she or he will ring a wall mounted bell to signify the end of chemotherapy, radiation or some other treatment. This is a very important event for the patient and I want the patient to feel cared for by the treatment team and to be reminded that the fight for their health will continue long after they leave the medical facility. To date, I have met with decision makers from various organizations. Some companies are using the bell as a symbol to drive their pledge programs and fund raising efforts – they are giving every donor a bell as a thank you for supporting the charitable organization the company is supporting. 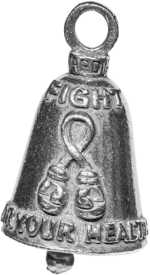 Some are selling to raise money for research and donating one bell to a cancer survivor. A business developer colleague of mine is in discussions with various nationwide healthcare organizations and is proposing that the CEO give a bell to every employee that has cancer or some other serious health condition to let the employee know that she or he is cared for and about. A few organizations are looking to give it to the donors that make contributions to their Foundation as a way to say ‘Thank You’. Again, the possibilities are endless as to who can benefit from the bell. You now know one aspect of what I do and how you can help support this important initiative – I am always looking to meet that next person who is interested in the well-being of others. One last thing I wanted to mention and it is probably the most important – many people have a strong emotional reaction [becoming very tearful and grateful] when they receive the bell as a gift as it was intended to be. It has been a very moving experience for me as well. I hope that you can ring the bell in someone else’s life that you care about!